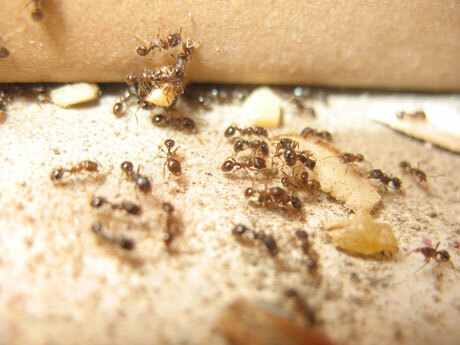 Has your Minneapolis home or business recently been infiltrated by a colony of ants? Have you tried all of the various ant traps and sprays on the market only to find more ants each day? If so, it’s time to call a MN exterminator like Eco Tech that can come in and take care of your problem once and for all. As an eco friendly pest control company we’ll get rid of your ant infestation in the most environmentally friendly way possible, using our less toxic organic product line. Don’t buy another over the counter ant control product; reach out to Eco Tech today to schedule your free pest control estimate. Over the Counter Ant Products are no Match for an Ant Colony! Did you know that the average ant colony could have between 300,000-500,000 ants? That’s a lot of ants! If you think you’re going to be able to get rid of an entire colony of ants with a simple ant trap or spray from the local garden center you’re sadly mistaken. When you see ants in your home or business it’s important to call in the pest control experts at Eco Tech to get rid of your problem all at once. The real key to effective ant control is finding the nesting location of the ants that are causing problems for you. The difficulty is that different species of ants nest in different areas and are handled with different types of chemicals. If you just blindly spray all sorts of chemicals to try and control your ant problem, you’ll likely do more harm than good. At Eco Tech we’ve been providing ant control solutions to our clients in the Minneapolis area for over 15 years and have a fully trained staff able to identity and treat all of the major ant species that are found in Minnesota. We hear some of our competitors say that our less toxic organic pest control products aren’t as effective as their much more dangerous options. The reality is that our products are just as effective and much safer for you as well as any kids or animals that live in your home. We’ve used over a decades worth of data to come up with the most effective and safe pest control treatment options to get rid of your ant problem effectively and safely. Reach out to Eco Tech today at 763-785-1414 to setup a free estimate with one of our pest control specialists.